My research goal is to develop efficient computer algorithms for data analysis and experiment planning in high-throughput structural and functional studies of proteins. Currently I am working on NMR (Nuclear Magnetic Resonance) assignment and protein structure determination. My work on the protein structure determination is an extension of RDC-EXACT method  previously developed in the Donald Lab. 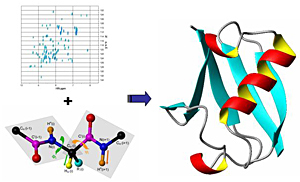 The RDC-EXACT method calculates the exact conformation solutions of protein backbone based on the NMR RDC (Residual Dipolar Coupling) constraints. Now I am trying this method for new protein structures and other applications such as protein docking. Another problem that I am working on is the automated NOE (Nuclear Overhauser Effect) assignment. One basic idea of my current project is to apply the rotamer library, the geometry relationship, and the backbone structure computed from the RDC-EXACT method  to help NOE assignment. L. Wang and B. R. Donald. Exact solutions for internuclear vectors and backbone dihedral angles from NH residual dipolar couplings in two media, and their application in a systematic search algorithm for determining protein backbone structure. Jour. Biomolecular NMR, 29(3):223-242, 2004. L. Wang and B. R. Donald. An Efficient and Accurate Algorithm for Assigning Nuclear Overhauser Effect Restraints Using a Rotamer Library Ensemble and Residual Dipolar Couplings. The IEEE Computational Systems Bioinformatics Conference (CSB), Stanford CA. (August, 2005) pp. 189-202.